XS Dog Harness Fits Dogs Up To 10 lbs XS Nylon Dog Harness For Dogs Up To 10 lbs  - $10.00 : Your Pet Store, Made in the USA! This is a harness made of very strong nylon with metal adjustment pieces. Even though the nylon is strong, it is still soft and flexible so that it is comfortable and does not damage your dog's hair. There are three adjustment pieces--one on each of the chest straps and one on the body strap. This ensures that the harness will fit your dog perfectly in the chest and body, and once you adjust it, the adjustment pieces cannot slip out of place. This harness fits dogs from 2-10 lbs. The body strap fits about 1" behind the front legs so that there is no chance of the nylon rubbing on the dog's legs. 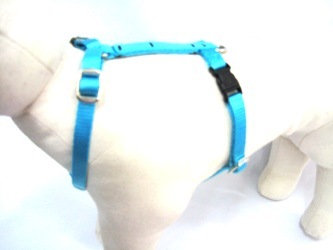 This harness adjusts from 8-14" around the body (all the way around the dog behind the front legs). This harness will give you more control while walking your dog, with no pressure on the neck. This harness is great for any XS dog, including growing puppies. It will fit most Chihuahuas, Min Pins, small Poodles, Yorkies, and all other XS breeds. If you need a smaller size, just let us know and we will make it for you! We make all of our products in the USA and offer colors you won't find anywhere else!